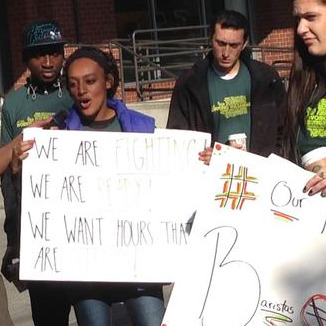 Darrion talks to Q13 & KING-5 about how Starbucks scheduling practices affect his life. Starbucks baristas marked International Coffee day on September 29th by heading to corporate headquarters this morning to reach out to co-workers, customers, and company executives about problems with the company's scheduling practices. Their message: Starbucks needs to fulfill its commitment to provide baristas with weeks that work, because #ourtimecounts. Instead of memos asking managers to “go the extra mile”, workers want to meet with Howard Schultz and develop policies that ensure we all have weeks that work. Darrion works at a Starbucks in South Seattle. Outside HQ, he explained: "We hear a lot of talk about how available we can be. It's time for Howard Schultz to be available to us, even if it's just to listen." Marie sometimes doesn't even know her schedule for the next day. Marie works downtown. "For all those listening," she said. "I don't even know my schedule past tomorrow." Inside the headquarters coffee shop, workers placed their orders under the name "Our Time Counts" — which meant that corporate execs waiting for their morning coffee heard lines like "tall vanilla latte for 'Our Time Counts'." We spread from corporate headquarters to locations across the city — talking to customers & co-workers, giving out leaflets, and making the case that every worker has the right to know when they're going to work, and how many hours they're going to get.